Summer tomatoes are the best tomatoes……ever! Their “winter” imposters at the store are just tasteless. Many of you are probably planting your summer gardens this month, and I hope tomatoes are on the list! We always plant 3-4 different varieties, you can never have to many tomatoes in my opinion! Large saucy tomatoes are one of our favorites. We use those in our salsa (post coming this summer) and canned tomato sauce. I also love to make summer tomato soup with this variety. Also in our “tomato patch” are Romas and Cherry tomatoes. Romas are great on anything, and cherry tomatoes are so good right off the vine or in salads. 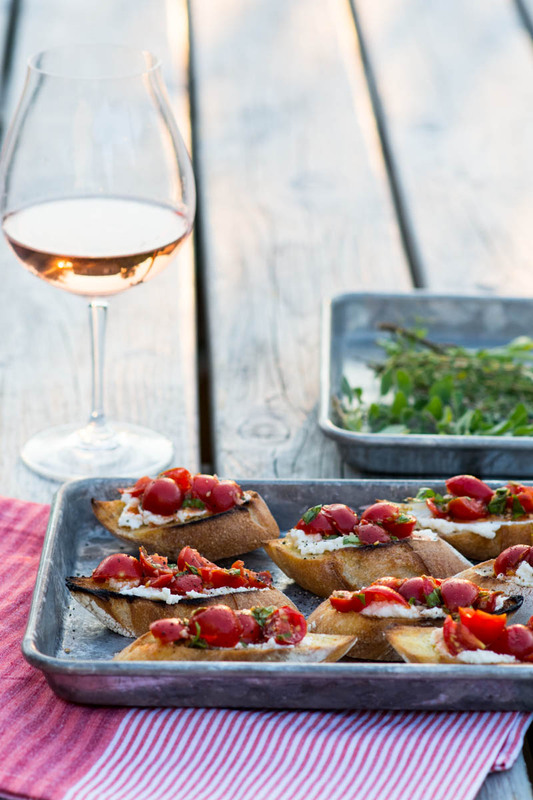 I also used cherry toms in this version of Bruschetta…. It’s a funny thing how our cravings and appetites switch gears with the seasons. Comfort food for Fall/Winter, and all things from the garden for Spring/Summer. If we had a yard big enough, we would have berry patches and an orchard or two I’m sure! We are currently working on that plan ;) There is a satisfaction in having a hand at growing your own food, I wish they taught this in schools everywhere! I didn’t start gardening until my early 30’s. Not sure why, maybe life was a bit too busy. My grandma always had a garden when I was little, and she would always give us her produce in the summer months. Now as an adult, I love my garden! Herbs are also a must for anyone who loves to cook. They too are also easy to grow. Basil,. Thyme, Oragano, Chives, Rosemary….we grow them and use them all year round! In a small bowl, add minced garlic and salt. Mash with a fork to make a paste, add 2 Tbsp of olive oil, vinegar and pepper. Mix well, add the tomatoes and let sit for 15 minutes. Heat a grill on medium heat. Brush sliced baguette with olive oil and cook over grill until toasted. About 2 minutes per side. 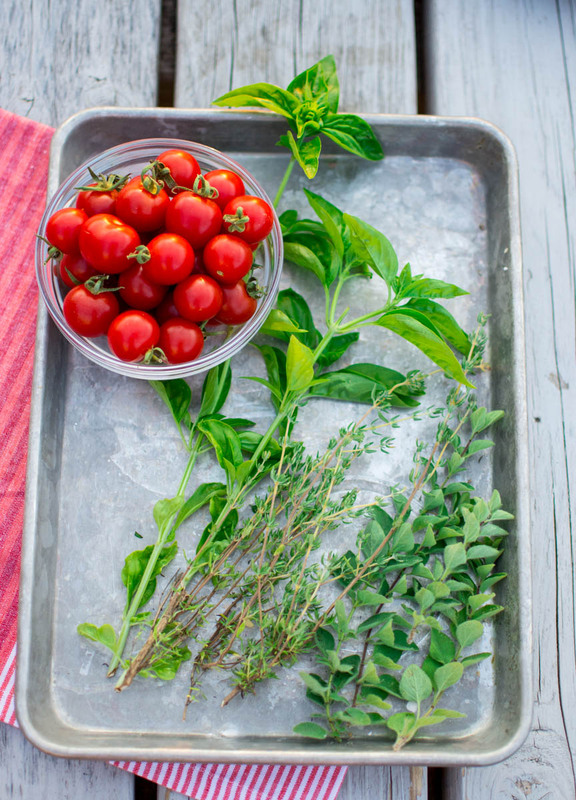 Toss herbs with tomato mixture. 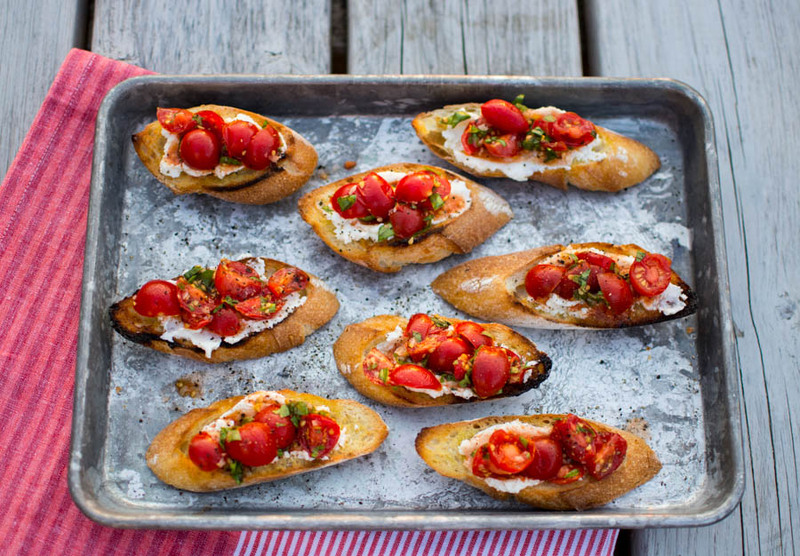 Spread ricotta over each baguette slice and top with tomato/herb mix. Oh yum! What a great appetizer for all those summer barbecues! Amazing. 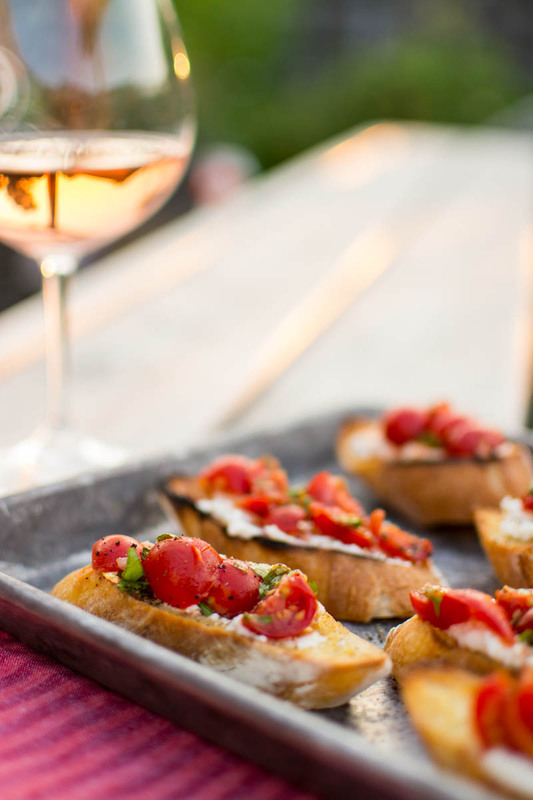 I would like that bruschetta and that glass of wine on a patio in the sunshine right about now! And gorgeous photos as always!